Definitely, there is still so much room to serve the growing healthcare needs of Filipinos. Thus, consumers and entrepreneurs alike are always on the lookout for better, wider, friendlier and more natural alternatives as source of affordable quality medicines that is not only accessible to their homes and communities but answers needs for convenience and high levels of customer service. 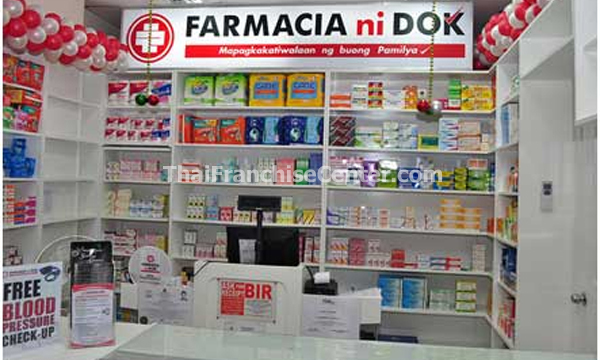 Likewise, the industry is ripe for more players that can offer aspiring business owners high demand products through the FARMACIA NI DOK franchise opportunity which has a proven business system. OPTION 1 - STANDARD FRANCHISE PACKAGE. This is an All - Generic Medicines. Investement starts at about PHP399,000.00. Initial inventory package are all generic with food supplements and galenicals. However, franchisee has the option to add branded medicines later on with additional investment to cover the upgraded franchise fee and medicines. Investement starts at about PHP699,000.00. Similar to the All Generic Start-up with additional branded and natural supplements. Investement starts at about PHP1.999,000.00. This package includes a 3 Premium Franchise package. This can be availed on staggered basis.